While I’ve been in Roanoke for over 2.5 years now, there’s a lot I don’t really understand–like why we have a giant star on the side of a mountain (sure, Wikipedia helped me with that one, but still), why people complain about the traffic (what traffic??? ), and, important to this post, the building called the Market Building and all the controversy surrounding it. For all of my time here (until this past fall), the Market Building was closed up and, theoretically, under renovation (those renovations didn’t start, really, until 2011). For all those who have been here longer, they remember it as a lovely place with Zorba’s, a Greek-Mediterranean restaurant, a pizza joint that schlepped post-bar pizzas out a window for $5 to the drunk masses, and Red Coyote, a Tex-Mex joint with decent food. 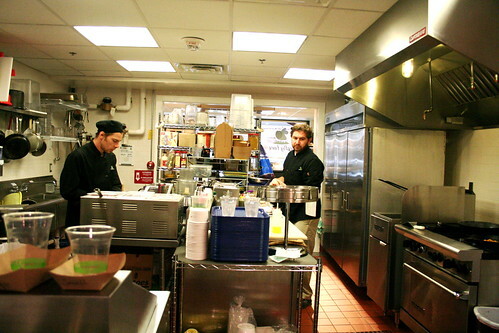 During the renovations, however, the Market lost its tenants and needed to sign new ones. The place is filling up, finally, but it’s taken a lot longer. And, embarrassingly, I haven’t given it much of a try yet. Even more embarrassingly, I hadn’t been to Firefly Fare until the last week or so. Why so awful? 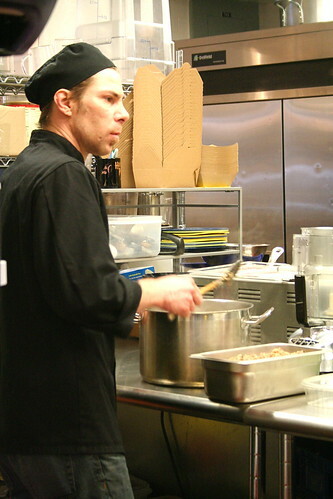 Chris, the owner-chef, is the chef I used to work with at Big Pine, now just over a year ago. It’s also one of the few joints in town that caters to vegetarians and vegans and it focuses on local food, sadly an oddity in these farm-filled parts of Virginia. Thankfully I did go check it out twice in the past week–once with G for a quick lunch when he was downtown and another time after my lunchtime swim. Both times the food was excellent–some dishes better than others–the service fast, and, thankfully, both times with a small queue, a sign that business is decent if not good. Firefly Fare gets some flack, mostly for its prices–an accusation unfair and unjust to the quality of the food. Roanoke’s a weird town, it expects everything to stay the same price-wise as it was back in 1998 and doesn’t account for the folks who truly care about food and where it comes from and who put in the effort to make it delicious. So, yes, I think paying $9-$10 for a really good lunch is absolutely acceptable. I’d have been lucky to pay so little in Atlanta or any other similar-sized town. The prices are the reason that I was relieved to see people purchasing lunches from the restaurant–people are starting to learn to buy healthy, delicious meals, even if they cost a buck or two more than the sports bar in the opposite corner (which, don’t get me wrong, I like that food when I’m watching a Steeler’s game, but for regular life I try to eat a little better for myself). 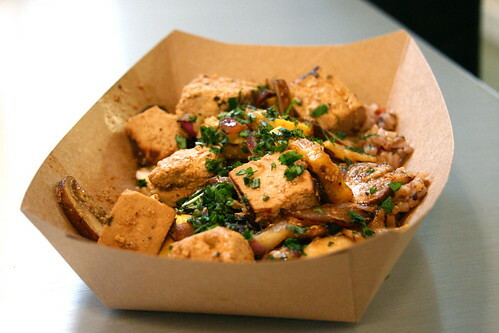 The first trip, G & I ordered two of Chris’ bowls–the Teriyaki Tofu Bowl and the Incan Bowl. I’m a sucker for anything layered with grains, veggies, protein, and sauce, so the bowls were right up my alley. Definitely something I’d love to order for lunch. Unfortunately (and we’ll get the one not-so-awesome dish, in my mind, out of the way first), the Teriyaki Tofu Bowl just didn’t do it for me. The rice was cooked perfectly and the tofu was so silky and tangy that I could have sworn it was paneer if I didn’t know any better (seriously good stuff), but the “Yellow River Spice” was sadly lacking. Instead, the bowl was overpowered with soy sauce, so cloyingly salty, that I had to empty my glass of water to eat half of it. A shame since I loved so much of the dish and it was obvious that Chris really knows how to cook tofu & mushrooms. G’s Incan Bowl, on the other hand, was incredibly satisfying. Black beans, sweet potatoes, and corn were served over a scoop of quinoa, again, cooked perfectly, with the veggies and beans seasoned quite well. Whereas the ingredients were lost in the soy sauce of the Teriyaki Bowl, each ingredient shone in the Incan Bowl–the sweet potatoes were slightly sweet with a nice roasted back note, the black beans held their shape and weren’t over salted, and the corn left a nice sweet pop with each bite. And both bowls’ servings were plenty big enough for lunch–I left with half of mine and G was completely satisfied with his. Not bad for a balanced meal at just $8 per bowl. 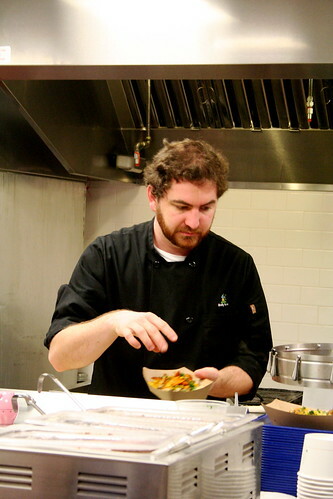 The second visit found me wondering how Chris’ Falafel Pita would hold up to my falafel-crazed scrutiny. But first, a look at his Sweet Potato & Coconut Soup. The soup is something I’m rather familiar with, he often served it at Big Pine and I often found myself scooping up a bowl of it with dried baguette chunks from Bread Craft. 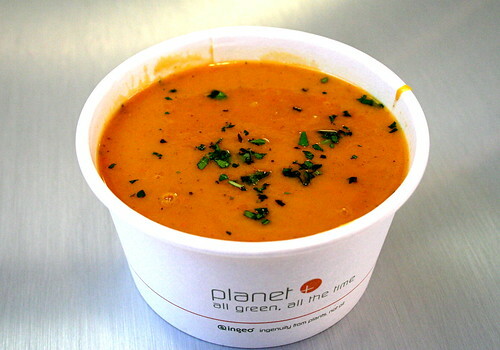 The soup was much the same–sweet potatoes pureed with coconut milk with a dash of lime juice added for acidity. Creamy, rich, and slightly sweet with a hint of the lime pulling through with each spoonful, it’s a soup you want to cozy up to on a warm evening. Maybe a little too heavy for the 60-something degree weather we’ve had lately, but that’s hardly anyone’s fault since it was February and all. But what about the falafel? I’m happy to report that I LOVED the falafel. The fried chickpea-garlic mixture was perfect–the right crunch on the fried outside, the right smoothness on the inside, and the exact amount of garlic that any falafel deserves. Just enough to know it’s there, but not too much to find it overpowering. I could eat a basket of those babies. Served on a fresh pita that must have been either made in-house or from a bakery in town (not like anything I’ve seen in the stores here–and if it is from somewhere I can buy it, help a sister out! ), the falafel was accompanied by grilled onions and a cucumber-mint sauce (I asked for no feta on mine in order to keep it vegan, though, looking back, I guess the sauce was probably yogurt based–fail. Such a fail. The sandwich would be amazing without the sauce though, I assure you.). The sandwich looked incredible when it was handed to me, but the one problem was that the pita, though delicious, couldn’t handle the weight or the mass of the falafel and etc. It cracked down the center. So I ate the sandwich like a salad, using some of the pita to scoop up the mixed greens, tomatoes, falafel, onions, and sauce. Which worked quite well and was quite tasty, but which failed my falafel sandwich requirement. So the jury’s still out on me ever getting a falafel sandwich/pita/wrap (whatever you want to call it) that matches the ones I’m used to in Atlanta-NYC-SF-New Orleans-Raleigh-etc. 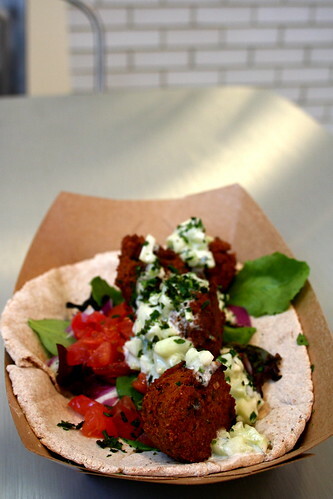 I’d kill for a street falafel yo. Falafel and soup consumed (well, half of the soup with to-go top for later), I ended the meal with a juice, the first juice-juice of my life, actually. Quite a few options grace the menu from green juices (spinach, kale, celery, cucumber, apple, lemon, ginger) to a “Bloody Mantis” (tomato, celery, beet, cucumber, cayenne), but I opted for the Firefly Flicker, composed of carrot, apple, parsley, basil, and lemon. More dessert-ish than the others. (Though I’d just had 3 vials of blood sapped from me earlier in the day at the doctor’s–routine check-up–so I figured the extra pow of nutrition couldn’t hurt.) Being a juice newbie, I had no idea what to expect, but prayed that it’d be nothing like wheat grass, which I can’t stomach to this day. 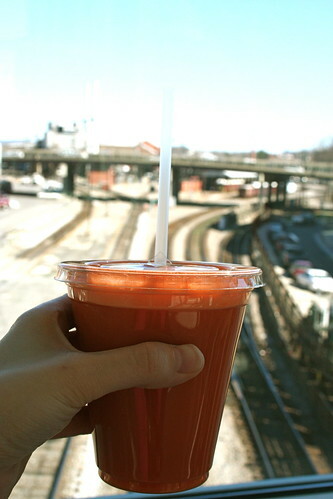 Thankfully, the juice was delicious–a bright balance of carrots and sweet apple with an herbaceous note from the parsley and basil. It’s still something for me to get used to, but I really enjoyed my glass, especially the part where I sipped it and walked back to the car in sunny, warm awesomeness. Overall, I really enjoy Firefly Fare. In contrast to my last post where I admitted to needing more than hippy-granola-healthy vegan food, I’ll eat my words and say that Firefly Fare hits the spot too (even if it *is* healthy, grumble, grumble). While I realize my vegan fail now with the sauce on the falafel, so many options for vegans exist at the restaurant and I love Chris for this. I love him even more for offering meat-eaters tasty, local, healthy options too, like a Prime Rib Panini (slow-cooked prime rib, fresh herbs, mozzarella, grilled onions, horseradish sauce) or Country Captain (free range chicken in a curried tomato sauce over wild rice). Plenty of salads grace the menu as well and there’s always a special for the day. And on the weekends he cooks up pancakes for brunch. It’s a shame I waited this long to try the food and I can guarantee I’ll be back for more–Firefly Fare is a gem for Roanoke and one that I hope we all here will continue to support. Wow, lovely, bright photos to go with some amazing sounding food. That Incan bowl sounds really perfect; I’d love to make something like that. Also, bad falafel is terrible but there’s nothing finer when it’s done right. The food looks great! Bummer on the tofu bowl, it sounds like they just need to adjust the seasonings a bit to make it a winner. 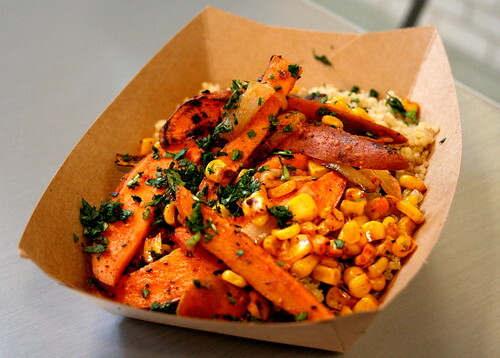 The Incan bowl looks awesome, I would love to try something like that! Hi, Jes. Just had to weigh in here—not on the food, though it looks delicious—but on the Roanoke Star. Don’t know if I ever mentioned this, but my husband grew up in Roanoke and we lived there for a time when we first were married (my daughter was born in Bedford). I loved the star from the first time I saw it. We had some tough times then and somehow the star represented hope for me. I know a lot of folks think it’s tacky (and I can understand that), but I found it beautiful. Also, speaking of food, it certainly isn’t vegan, but if you like big, greasy subs, there is surely no big, greasy sub better than the New Yorker sub at the New Yorker deli on Williamson Road. I still dream about that sub—I have never, ever had one better. Sub nirvana. Wow, what a wonderful selection of foods here, Jes. I’m like you when it comes to seasoned tofu and perfectly cooked grains – so satisfying! Wow, if you hate Roanoke so much, why don’t you leave. You are obviously waaay to cultured for this area, and deserve to be “in Atlanta, or some similar sized town”. Also, you are a lousy writer.